Students are learning all about the art of barbering from its history to the latest techniques. William Floyd High School barbering students. 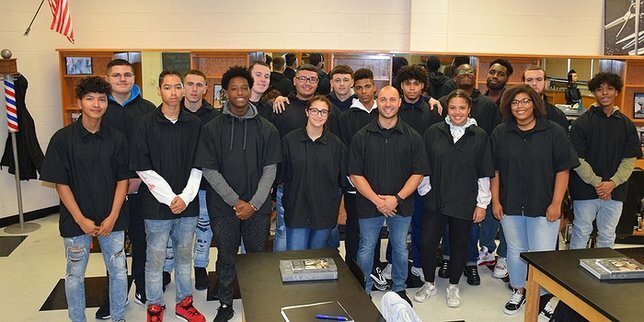 Mastic Beach, NY - October 25, 2018 - The William Floyd High School barbering course, now in its first full year after a half-year kickoff last school year, is rolling along with a brand new, fully-functional barbershop located in the same wing of the high school as the award-winning Cosmetology Academy. The program, taught by Anthony Montanez of Monti’s Barbershop in Moriches, serves approximately 30 juniors and seniors combined and continues to train students in all aspects from haircutting to shaving and everything in between. In the course, students are learning all about the art of barbering from its history to the latest techniques, facial grooming, client consultation, shampooing, draping a customer and more. Students also receive instruction in the business aspect of running a successful barbershop with guidance from Mr. Montanez along with Business Academy tie-in courses such as Accounting and Virtual Enterprise. Students who successfully complete this program are prepared to take the New York State Licensing examination to become a Master Barber. In addition to barbering, the William Floyd School District offers a variety of Career and Technical Education (CTE) programs for students including automotive technology, business, building trades & construction, cosmetology, culinary arts, medical assisting, small engine repair and technology. Each course provides students with opportunities to earn college credits in their chosen field, gain valuable life skills and prepare for entry-level employment in their program of study. Now more than 350 students are enrolled in CTE courses at William Floyd High School and students graduating with a CTE endorsement on their diplomas have the opportunity to work after graduation as a barber, a medical assistant, an automotive technician, an entry-level carpenter/carpenter’s apprentice/carpenter’s helper and as a licensed cosmetologist; they can also earn college credits for post-secondary education in the culinary arts, earn endorsements in business (accounting, small business management, Microsoft office specialist) and in technology (architectural drafting and engineering). Subject: LongIsland.com - Your Name sent you Article details of "William Floyd High School Career and Technical Education Barbershop Fully Operational"